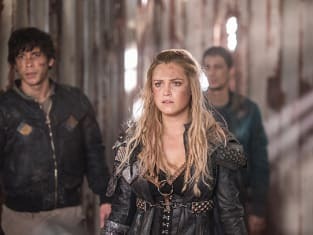 It was a case of one step forward, two steps back on The 100 Season 3 Episode 13. 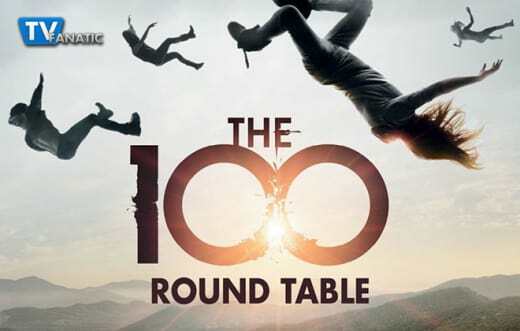 Join TV Fanatics Yana Grebenyuk, Allison Nichols, Kelly Thompson, Paul Dailly, and Meg Bonney as they chat about all of the amazing events that occurred in this week's round table discussion! Let's talk about that Bellarke moment. How do you feel about Bellamy and Clarke's conversation, right before they were nabbed by those sea-Grounders? Yana: I love Bellamy and Clarke. I knew this week would have an intense moment between them, so I couldn't not love their scenes. Everything from their long hug to Bellamy wanting to make sure that Clarke was the last thing he saw. But then my friend Meg (a writer for Cuddlebuggery) posted her recap about how she wished it wasn't as rushed. And I have to say that while I really enjoyed the message of the Bellarke conversation, these two need to figure things out that don't take under five minutes to talk out. This season was rushed because of the first half and the accommodations they had to make, but hopefully with season four we might see Bellamy and Clarke really deal with everything. Allison: The scuba people are Bellarke ruiners. Couldn't they have waited a bit longer to nab Bellamy and Clarke? Talk about rude. I love that with Clarke, Bellamy isn't afraid to admit his fears that he has lost Octavia and that Lincoln's blood is on his hands. Bellamy allowed himself to be vulnerable with her, and in return, Clarke opened up about how she's still dealing with the blood on her hands. I really wish we got to witness Clarke, Bellamy, and Monty process their actions at Mount Weather. Instead, it was a casualty of the time jump and the first half of this season. Kelly: I'm not a fan of Clarke and Bellamy romantically but their friendship and understanding of each other has always been a high point for this show. There are definitely things they need to talk out, but I'm fine with it being rushed because I want a quick resolution so they can go back to being the leaders their people need. Paul: I have to agree with Kelly on this one. Bellarke would be terrible as a couple, but they are great as friends. They have so much more in common than they think. I enjoyed their conversation, but Clarke's dialogue was somewhat cheesy, and it took the emotional impact away from it all. Meg: Bellarke!!!! He smelled her hair guys! He smelled her hair!!! I was so happy to have them in a scene together because, while I am a big fan of them as a potential couple, I love them more as a partnership. It felt super honest. She has been asking for forgiveness from him for a while and he stayed mad and I liked that he told her why he was mad. They are going to get past this and kiss and have babies. Ok, maybe just get past it, but I am still very happy! Luna refused to take the flame and become the Commander! What's going to happen now? Yana: Clarke won't back down, if you ask me. ALIE is a serious threat, so in my mind they might somehow try to work around it. Maybe conjure up a way to figure it out without going against Luna's wishes. The group can't exactly leave which gives them time to figure a plan out with Luna nearby. Allison: Was anyone shocked that she said no? I mean, really? Clarke needs to spell out how grave the situation is at Polis with Ontari as the Commander. Of course she doesn't know about the City of Light terror that's reigning down in Polis now, but Ontari as Commander was scary enough to prompt Clarke to take this quest. I also hope that we get to hear Luna talk about why she left the conclave. A flashback would be amazing, and hello, a flashback means LEXA! Kelly: I agree with everything Allison said. Of course Luna refused the chip. She has already done it once by leaving her conclave so why wouldn't she do it now when people she has never met ask her to take the chip out of nowhere? An explanation as to what is going on Polis and with the Grounders is needed for Luna to understand that she is the only way the killings and war will stop. Luna's backstory is a mystery and I want to know more so hopefully next week Luna will tell us her connection to Lexa and why she ran. Paul: It was obvious she was going to decline it. There's a reason she done a runner. I agree that a flashback of Lexa would be great, but there's going to be a lot of melodrama to get to that stage and I don't know if I care for that. Meg: I was not at all shocked by her choice. But I have to say, I already love Luna. I love her giant hair, no-kill attitude. She is a hippy grounder who wants nothing to do with their government system. I think she will come around OR Bellarke will force it on her. Either way, fun times for all. 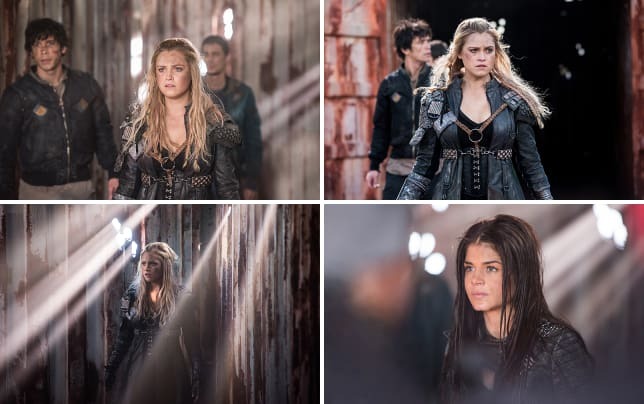 The 100 Photos from "Join or Die"
Kane took the City of Light chip to save Abby. React. Yana: My heart literally ached for Kane. He went through an endless amount of pain, but taking the chip for Abby was accurate. There are certain characters like Clarke, Bellamy and Kane who I see truly putting their people first. I mean it in a very serious way where these characters can't be threatened by death because they would take that in a second over their loved ones. The only way to get them to take this chip is to threaten the ones closest to the which is what we saw with Kane. Abby actually did the exact same thing for Raven and the more we see of this plot the more we see how far some of them would go for each other over themselves. Allison: I'm still cringing over Kane being crucified. It was a lot, and that was some heavy religious imagery, so I am kinda excited to see why that particular method of torture/death was chosen. Kane took the chip to save the woman he loved. He would never be able to live with himself if he allowed Abby to die. Kane is a great loss to the non-chipped and their mission to save, well, everyone. Kelly: Time and time again this show proves that love is weakness. Kane took the chip to save Abby, and Abby took the chip to save Raven. ALIE uses love to her advantage over and over again, so I'm wondering if love is the thing that will stop ALIE. Also, I loved that Kane knew it wasn't the real Abby when she started to throw herself at him. Kane knows Abby well, and the real Abby would never do that. Once again proving that ALIE doesn't understand love, she just knows how to use it as a weakness. Paul: I get why Kane felt the need to take it, but what would have been the point in killing Abby in the first place? Obviously, Kane would have probably took the chip to numb the pain, but then ALIE wouldn't have gained another number if Abby was dead. That's what I like to call The 100 logic. Meg: I agree with the fine folks above. ALIE is using love to force people into taking the chip, so it wasn't shocking. It WAS shocking to see him crucified. It was cool to see the chip kick in. He went from crazy pain to just chilling. What did you think about those flashbacks to Pike on the Ark, teaching the kids a crash course in Earth Skills? Yana: Flashbacks on this show are my bread and butter. I enjoy how they aren't written every week just to please the viewers, they only appear when they really matter to the plot. This week, we saw it connect back to Pike, but while they had this flashback door open they let some other moments slip through. Seeing how everyone got onto the Dropship, connecting our favorites that may not even be around anymore to the background song ''Radioactive'' was brilliant work. Mike Beach tackled Pike's scenes with unbelievable talent, because right off the bat I felt his pain. I felt how broken he was trying to teach these kids skills that he thought they wouldn't even use because their chance at survival was barely there. I felt his anger when no one would listen to his pleas. And I really felt that last attempt to keep these people safe with that last ''lesson.". Allison: I loved the flashback so much. We got to see our children before they were sent to the ground, and we were reminded of how much everyone had changed. Well, not Murphy, he's still the same. The flashbacks also allowed us to get a better sense of the man Pike is. He fought for the survival of the kids. I honestly didn't understand the graduation class. It just doesn't compute. Kelly: The flashbacks were great. I wish they would have showed them earlier so we all would have understood Pike sooner. Pike was instantly hated and if the flashbacks would have happened quicker, it would have been much harder to hate him outright. Paul: I didn't care much for the flashbacks. I feel like the show needs to kick the pace back up a few gears. It's glaringly clear that they peaked with The 100 Season 2. Meg: I flipping loved the flashbacks! It made me sympathize with Pike and I wasn't expecting that. He really is trying to do what he thinks is right. I also loved that they used the same song from the pilot but a slowed down, haunting version. A+! Murphy convinced Indra not to kill Pike and now the three are in an uneasy alliance to fight back against ALIE/Jaha. What's up with that? Do you buy it? Yana: I buy that they will work together to destroy their common enemy but once that's finished all bets are off. Indra is a warrior that follows her people's rules. She might put her anger aside for now, but it isn't forever. Pike made choices that he can't take back and the fact that he doesn't really want to doesn't help. It's how you approach your mistakes that matters on The 100, and Pike still seems to be determined in his ways. Allison: Motivational speaker Murphy for the win! I'm so proud of him. I definitely buy it. Everyone in that cell has witnessed what is going on outside on the streets of Polis. They know that there's danger, and that they, the non-chipped, are outnumbered. The ground is all about survival, and right now, they need to rely on their enemies to survive. Kelly: They will work together to bring down ALIE/Jaha more than likely with the help of Clarke and the gang when they return with Luna. But Indra will also get her revenge, and I hope Octavia gets to help in ending Pike. Paul: It did make sense in the long run. What's the point in diminishing the numbers on the side of the good? Meg: It's so crazy that John Murphy is the voice of reason. The flashbacks showing them fighting and then cutting to Murphy really shows that Murphy has moved past selfish to survival and logical. He is doing the right thing, not because of Pike, but because it will help them survive. Who was this episode's MVP? Yana: Is 'everyone' an easy way out? I would say anyone who was in Polis this week. Kane, Pike, Indra, and Murphy stood out the most to me this week. Allison: I'm going to give it to Murphy. He managed to get people to put aside their hatred for one another and realize that they are facing a much bigger threat. 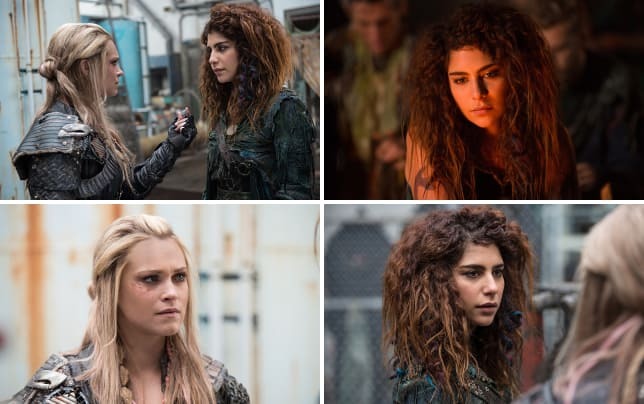 It's no easy feat to stop Indra from getting her justice or to get Grounders to listen to someone from Skaikru. Murphy's stepped up as a leader, which was awesomely unexpected. I can't wait to see how Murphy comes up with a plan and gets everyone to work together to stop ALIE. Kelly: Octavia. Marie Avgeropoulos has been killing it lately. Her scream when she thought Luna was nowhere to be found was a gut punch. I also loved how quickly Octavia drank whatever it was the Grounders gave them. Octavia has been fearless, and I don't want it to stop anytime soon. Paul: I'm going to go with Octavia. She has really developed into a great character over the course of the series, but she took it a whole new level this week. I can't wait to see what's next for her. Meg: Lincoln. He was the one who taught O to say she needed safe passage in Trigedasleng way back when, he kept a detailed journal, and he even put a sprig of the signal fire plant in his book. Without him, they would never have had a chance of finding Luna. 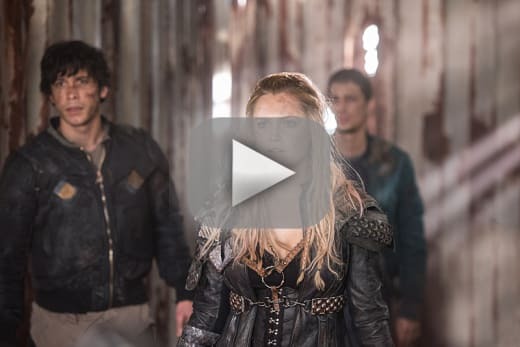 Don't miss The 100 Season 3 Episode 14, and get your first look at it below! The 100 Photos from "Red Sky at Morning"